Hello my friends! 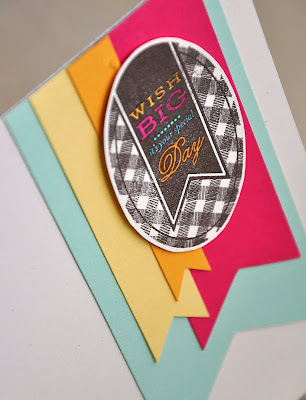 So glad you're joining me today for the Papertrey Ink March Countdown! Before I begin with this months first group post projects, I'd like to give you all a little personal update. But, if your not up for it please feel free to scroll down a little. Personal Update: So, things have been a bit quiet around here. I really haven't been up to much the last 2 1/2 weeks except for recovering from surgery, an operation to replace my torn ACL. It may surprise most of you to know that, in addition to stamping and card making, I enjoy riding my dirt bike. Crazy, I know! It's been an activity that my husband and I have enjoyed together for over 10 years. I've taken my fair share of spills, but this last fall was the one that finally got me. Anyways, the operation went very well and recovery is moving along slowly but it sure is nice to finally be down to one crutch and back in the craft room. So forgive me if my creations are not up to snuff this month. 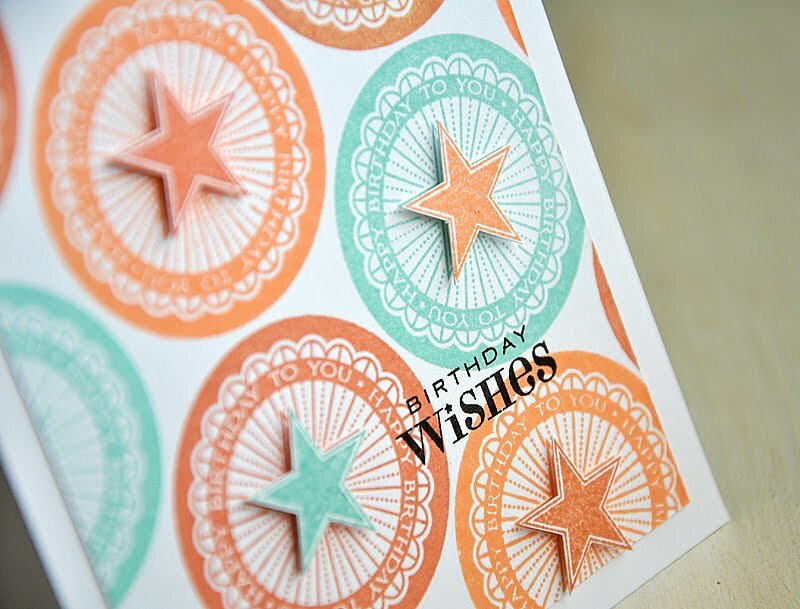 First up is a Happy Birthday To You collection. This collection uses a soft yet fun color combo of Aqua Mist, Melon Berry and Dried Marigold (a Ranger Distress Ink). 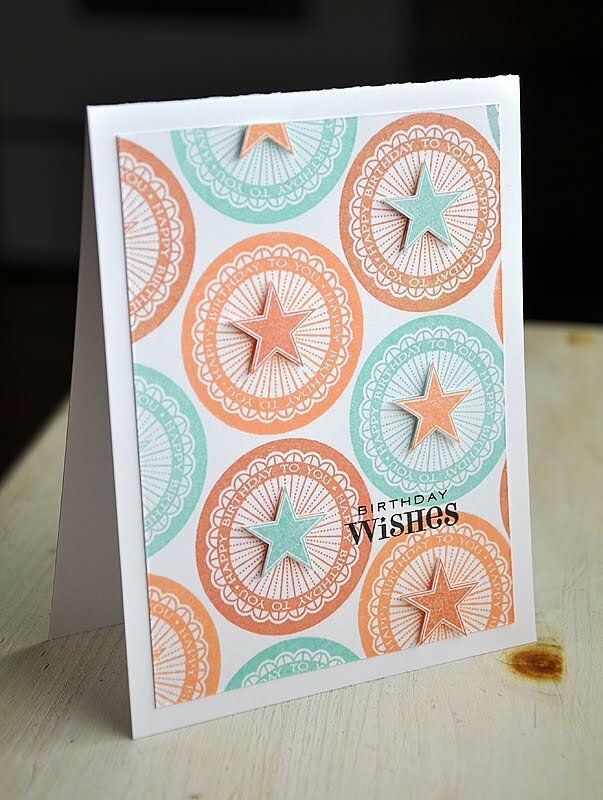 This birthday card began by stamping the star circle tag image, in the above colors, onto a white cardstock panel. I trimmed additional stars and attached them with dimensional adhesive. Finished the panel off with a sentiment stamped in Smoky Shadow ink and then attached the stamped panel onto a white card base. 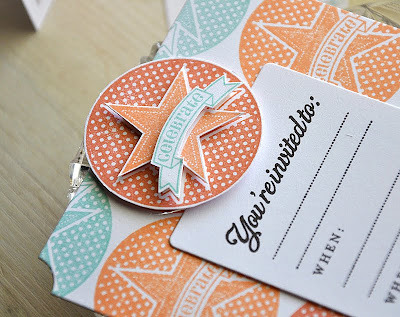 I then created a coordinating tag. 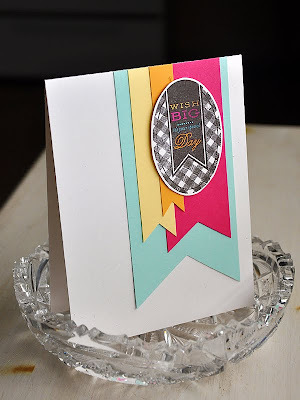 Simply die cut a Tag Sale #5 tag from white cardstock. Attached a punched star circle tag and a die cut flourish (from Fancy Flourishes). 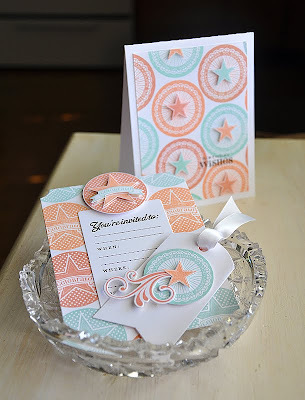 To complete this party ensemble I created an invitation by die cutting a base from white cardstock using one of the new Card Base-ics dies. 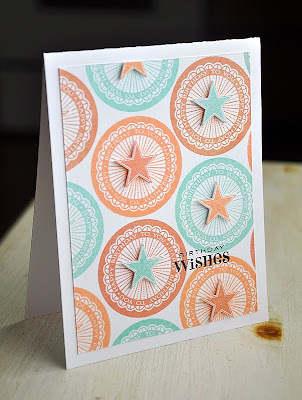 Stamped the base with a second circular tag image in the same color combo. I then inserted a die cut Button Card after stamping it with the info lines from By Invitation. 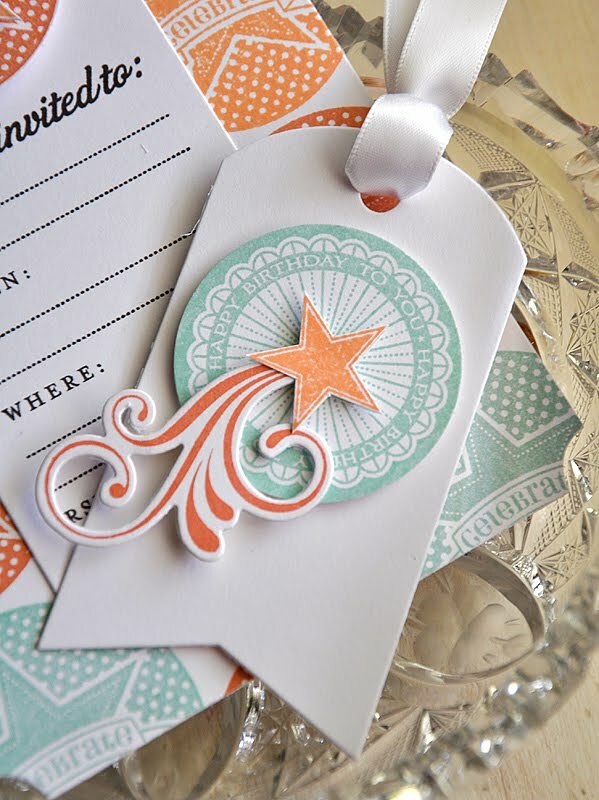 Topped it all off with an additional star circular tag images, which was stamped and trimmed to match. I have a couple more cards to share with you today, to help show case the 2012 Birthday Tags stamp set. 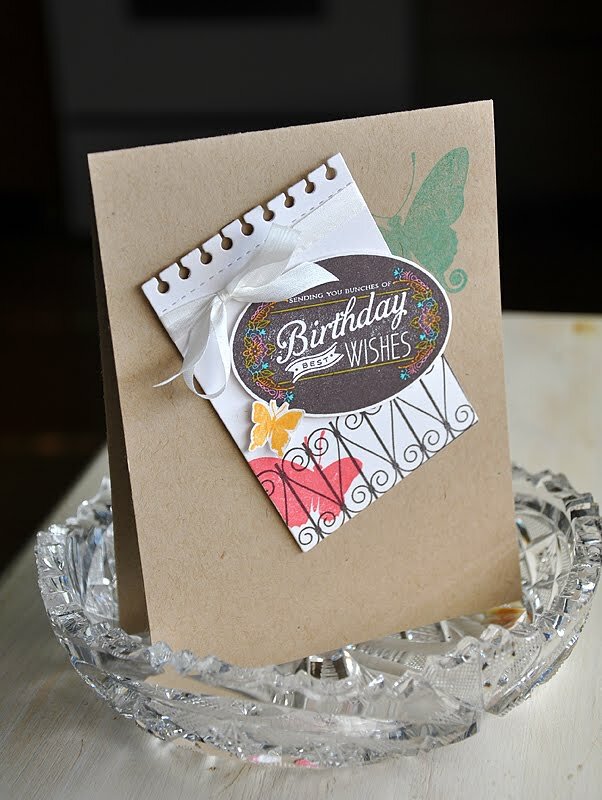 First up a pairing of 2012 Birthday Tags and Background Basics: Wrought Iron with Beautiful Butterflies. 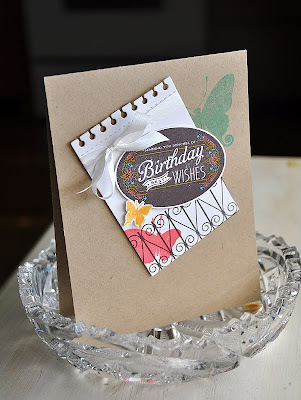 I stamped the Birthday Best Wishes oval tag in Smoky Shadow ink and colored in the details with a few colorful Copic markers (BG13, R32, YG95 & YR15). 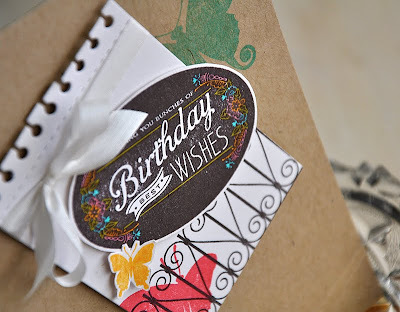 Attached the tag to a die cut Spiral Notebook Page, stamped with butterflies and wrought iron. Wrapped it with silk ribbon and attached to a kraft card base. Lastly, a simple card inspired by this oval tag featuring a small banner sentiment. I attached a number of colorful hand cut banner edged strips to a Rustic White card base and topped them off with the oval tag, after I colored the sentiment with coordinating Copic markers (BG13, RV17, Y35 & YR15). Your cards are just gorgeous! So soft and pretty! I tore my ACL many years ago, so I am doubly amazed at your beautiful work! Beautiful projects, Maile. And YES, I am totally surprised by your mix of papercrafts and dirt bike. I would never have guessed. Wishing you a speedy 100% recovery. Well Maile you would never know from your creations that you had injured yourself...these are truly gorgeous...I hope that you mend quickly, thinking of you and sending you many get well hugs..
Good to hear you are getting better, Maile! Hope you are up and running - no driving :-) - again back soon!!! Your cards are beautiful again, good to see them!! Thanks for sharing your creativity!! Hugs & all the best! Glad to hear that you are healing! Happy healing! Your projects are beautiful. Your designs are absolutely fabulous as usual!!! You never cease to amaze me!!! Thanks for always inspiring!! Wishing you a speedy recovery and it's good to see you back to blogging!! Now looking at that sweet photo of you I would NEVER guess you rode dirt bikes...never! And if this is work is "not up to snuff" then I'm never going to make another card again. You rocked all of them and on crutches even!! Knowing that you dirt bike only makes me love you more. I'm sorry to hear that you ended up in surgery because of it, though! And puh-lease, not up to snuff? I don't think you're capable of not up to snuff! These are gorgeous. Wishing you a speedy recovery!!! I can't imagine your creations ever not being "up to snuff" Maile! These are wonderful, as always! I'm glad your surgery went well! Wishing you a speedy recovery! Definitely "up to snuff", Maile. :) Everything's just gorgeous. Wishing you a speedy recovery!! So sorry to hear about your torn ACL. Many wishes for a speedy recovery. Your creations today are just gorgeous. Completely up to snuff Maile! You are amazing and I just love your work. Hope you're healing up smoothly! Dirt biking? Would never have guessed. Happy Healing, Maile! Your cards are simply stunning and just my style. Can see some CASE-ing in the works. Take care! So nice to see you back!! Wishing you a speedy recovery. Your cards are... once again .... just lovely!! Hi Maile. I hope your recovery is speedy. Your projects are always beautiful - these are no exception! Thanks so much for the inspiration! Beautiful as always, Maile! Most definitely "up to snuff"! 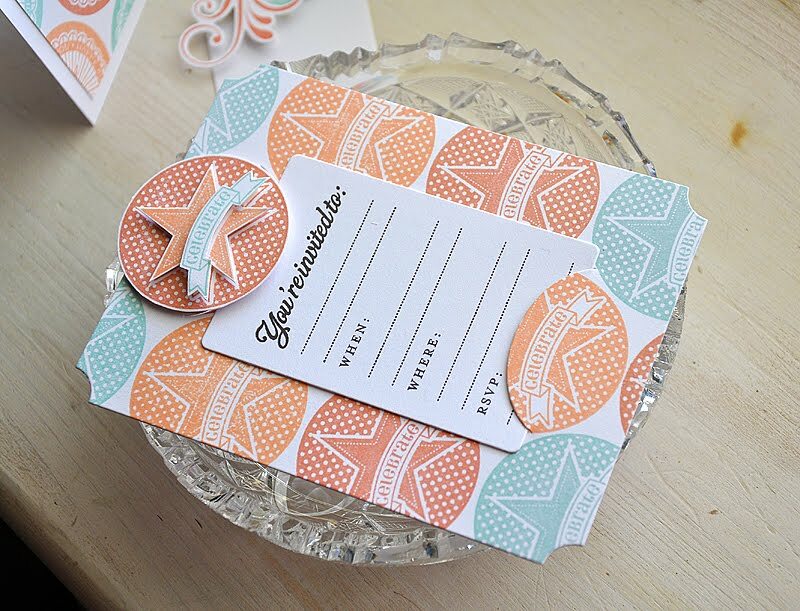 If I may, I must ask you how you create such perfect hand cut banners such as those on that last card...I'd love some tips if you'd like to share! Thanks for the inspiration! We've missed you. All the best as your recovery ends and you are back to normal! Beautiful samples and I have totally missed you! I hope you continue healing and listen to the Dr and PT person! My hubby plays soccer and has had to have his ACL repaired. Good Luck to you! And thanks as always for your wonderful work! Glad to hear you are doing better! I love that you are out there with your husband riding bikes! I am not so good on the bike but I have a Kawasaki Mule...I can tear it up pretty well on that! LOL! Your projects are amazing as always Surgery didn't slow you down one bit! Hope the rest of your recovery goes well! Glad to know the surgery went well and you're gettin' back in the groove! :) My daughter tore her ACL back in high school so I remember the physical therapy and all it took to get her mobility back. *hugs* And, your projects, as always, are a delight to the eye! Take good care! youre work always look so perfect! i love the layered banners you made. hope recovery goes smoothly from here on out! Beautiful projects!!! Hope your recovery goes smoothly!!! Not up to snuff - what the dickens??? Amazing, as usual - love the designs and colours ways you put together. Not up to your usual snuff, I think not. All your projects are awesome, I love the colours. I hope you have a speedy recovery. My husband, son and my daughter are all avid dirt bikers! Love your cards as always. Feel better...I have gone through knee surgery too (thankfully, not the acl, but still). Be sure you do all the rehab...it is so critical! Hey Maile, I am a dirt bike girl too. I ride a Honda and my husband and 2 boys are on KTM's. My husband just had his 2nd ACL replacement on 2/7 and is back up and going. Of course he would love to get back on the bike, but that must wait. The first week is the worst. Just wanted to let you know I love the work you do... such a great inspiration for me.